AMU and APU students are eligible for 10 free hours of tutoring provided by APUS. Tutor.com connects you with a professional tutor online 24/7 to get help with assignments, studying, test prep, resume writing and more. 10 free hours are for a student's APUS school career and are not renewable per semester, per year, or with subsequent degrees. Tutor.com is closed on New Year's Day, Independence Day, Thanksgiving, and Christmas. Tutor.com gets you an expert tutor whenever you need help, 24/7. You don't need to make an appointment—or even leave the house! 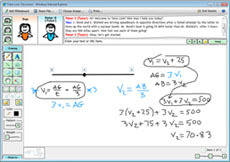 You and your tutor work one-to-one in our online classroom on your specific problem until it's done. Everything happens in real time, online. Every subject we tutor is open all the time, every day. You can get a tutor whenever you want, from anywhere in the world. Our tutors are real people. They know what it's like to get stuck, and they're here to help. Tutors are available 24/7, in every subject, including Algebra, Calculus, Geometry, Trigonometry, Physics, Chemistry, or English. And, every tutor is screened and background-checked. What happens when I reach 10 hours?